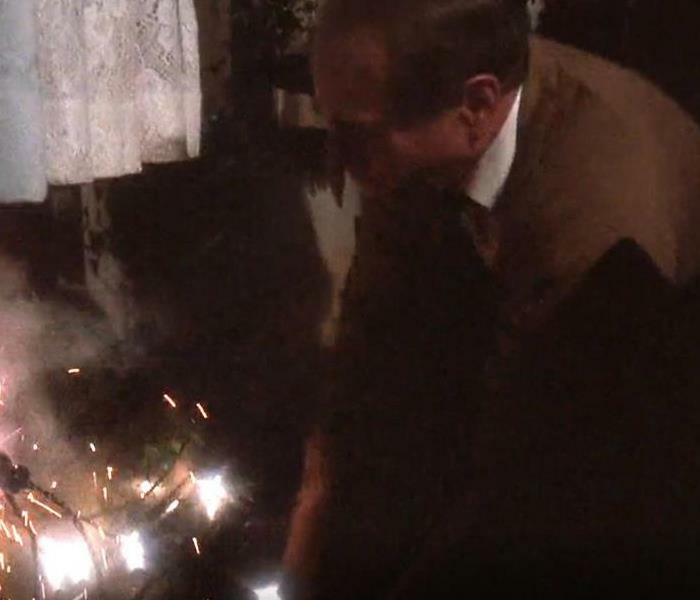 A Christmas Story potential fire hazard. Over time, the blades inside an electrical outlet become loose. While it is a nuisance to you, loose blades are also an extreme fire hazard. These free blades cause extra heat to generate, which may lead to a fire. If you notice your outlets are no longer keeping plugs in, replace them. Although there is space to plug in four appliances, this does not mean it is always safe to do so. You could overload the socket.This could cause the plug in the wall socket to overheat and possibly cause a fire. So don't be like Ralphie's dad, and be aware and be safe! Ice buildup on your roof can cause significant damage to your home. ... Ice dams are usually caused by poor ventilation in your attic. The warmer attic air melts the snow on your roof and the melting snow runs down your roof and under areas such as gutters before it is re-frozen by the colder outside air. If you experience damage to the interior of your home, call your insurance company. Then call SERVPRO of E. Jackson/SE Ingham Counties. Once the ice has been removed, we can determine where there is moisture inside and get that dried. 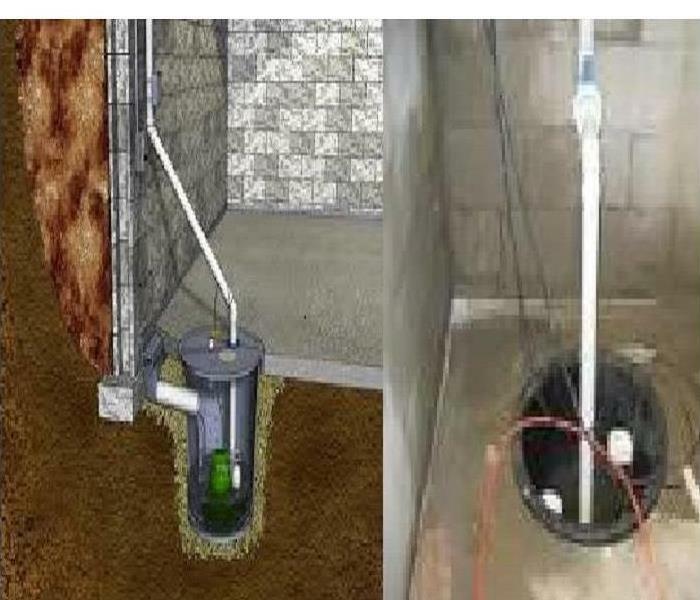 A sump pump is a small pump that is installed to help keep the area underneath a building dry and to prevent it from flooding. They are installed in the lowest part of the basement or a crawl space. They are normally installed in specially constructed pits which is where water flows into through drains or through migration through soil. The pump’s job is to pump the water out of the pit and away from the building. Should you still get water in your basement from sump pump failure or inability of sump pump to keep up due to the amount of water coming in, call SERVPRO of E. Jackson/SE Ingham Co. and we can help with the clean up. We will address your structure as well as any affected contents and set the proper drying equipment to ensure your basement is thoroughly dried out. We can be reached @ 517-782-8533. Since 1922, Fire Prevention Week has been observed on the Sunday through Saturday period in which October 9th falls. Fire Prevention Week was established to commemorate the Great Chicago Fire, the tragic 1871 conflagration that killed more than 250 people, left 100,000 homeless, destroyed more than 17,400 structures and burned more than 2,000 acres. The fire began on October 8th, but continued into and did most of its damage on October 9th, 1871. According to popular legend, the fire broke out after a cow-belonging to Mrs. Catherine O'Leary- kicked over a lamp, setting first the barn, then the whole city on fire. Chances are you've heard some version of this story yourself; people have been blaming the Great Chicago Fire on the cow and Mrs. O'Leary for more than 130 years. But, recent research by Chicago Historian Robert Cromie has helped debunk this version of events. Like any good story, the 'case of the cow' has some truth to it. The great fire almost certainly started near the barn where Mrs. O'Leary kept her five milking cows, but there is no proof that O'Leary was in the barn when the fire broke out, or that a jumpy cow sparked the blaze. Mrs. O'Leary herself swore that she'd been in bed early that night, and that the cows were also tucked in for the evening. So if a cow wasn't to blame for the huge fire, what was? Over the years, journalists and historians have offered plenty of theories. Some blamed the blaze on a couple of neighborhood boys who were near the barn sneaking cigarettes. Others believe that a neighbor of the O'Leary's may have started the fire. Some people have speculated that a fiery meteorite may have fallen to earth on October 8th, starting the several fires that day - in Michigan, Wisconsin, as well as in Chicago. While The Great Chicago Fire was the best known blaze to start during this fiery two-day stretch, it wasn't the biggest. That distinction goes to the Peshtigo Fire, the most devastating forest fire in American history. The fire, which also occurred on October 8th, 1871, roared through Northeast Wisconsin burning down 16 towns, killing 1,152 people and scorching 1.2 million acres before it ended. Historical accounts of the fire say that the blaze began when several railroad workers clearing land for tracks unintentionally started a brush fire. Before long, that fast moving flames were whipping through the area 'like a tornado', some survivors said. It was the small town of Peshtigo, Wisconsin that suffered the worst damage. Within an hour, the entire town had been destroyed. Those who survived the Chicago and Peshtigo fires never forgot what they had been through; both blazes produced countless tales of bravery and heroism. The fires also changed the way that firefighters and public officials thought about fire safety. On the 40th Anniversary of The Great Chicago Fire, the Fire Marshall's Association of North America decided that the anniversary of The Great Chicago Fire should henceforth be observed not with festivities, but in a way that would keep the public informed about the importance of fire prevention. Fire Prevention Week is the longest running public health safety observance on record dating back to 1920. Here at SERVPRO of E. Jackson & S.E. Ingham Co., we take pride in our services and the caring of your home. When our services are complete, we still have work to do. Upon arrival back to the shop, our staff thoroughly cleans and sanitizes all of the equipment. We also maintain equipment to be sure it is properly working before we transport it to the next disaster. Rest assured, the equipment being placed in your home is clean, sanitized and doing its job successfully! Responsible Dog Ownership Day is celebrated annually on the third Saturday in September. SERVPRO of E. Jackson & S.E. Ingham Co. wants all of you pet owners to know these important facts. An estimated 500,000 pets are affected annually by home fires; however, nearly 1,000 house fires each year are accidentally started by the homeowners' pets, according to a new data analysis by the National Fire Protection Association. "Not many pet owners realize that their pet can actually be the cause of a devastating fire," said AKC spokesperson Lisa Peterson. "Simple prevention measures, such as flame-less candles and stove knob covers, can mean the difference between life and death for your four legged friends." Planning for unexpected emergencies like home fires and taking precautions are an integral part of responsible pet ownership. AKC and ADT offer the following tips to educate pet owners on how to prevent your pet from starting a fire, as well as how to keep your pets safe. Extinguish open flames- Pets are generally curious and will investigate cooking appliances, candles, or even a fire in your fireplace. Ensure your pet is not left unattended around an open flame. Remove stove knobs- Be sure to remove stove knobs or protect them with covers before leaving the house. According to the National Fire Protection Association, a stove or cook top is the number one piece of equipment involved in your pet starting a fire. Invest in flame less candles- These candles contain a light bulb rather than an open flame, and take the danger out of your pet knocking over the candle. Cats are notorious for starting fires when their tails turn over lit candles. Beware of water bowls on wooden decks- Do not leave a glass water bowl for your pet on a wooden deck. The sun's rays when filtered through the glass and water can actually heat up and ignite the wooden deck beneath it. Choose stainless steel or ceramic bowls instead. Keep your pet near entrances when away from home- Keep collars on pets and leashes nearby in case firefighters need to rescue your pet. When leaving pets home alone, keep them in areas or rooms near entrances where firefighters can easily find them. Secure young pets- Especially with young puppies, keep them confined away from potential fire starting hazards when you are away from home, such as in a crate or behind baby gates in a secure area. Also know that in the event of a disaster, SERVPRO of E. Jackson & S.E. Ingham Co. is here to help. Kids and teens across the country are called to "take over their kitchen's" on September 13th using their favorite recipes and make a meal for their family! The main objective behind this mission of the Young Chefs Academy (YCA) is to empower kids and teens to become more actively involved in meal planning, preparation and cooking of meals. The YCA is fostering family bonds and actively fighting the battle against the many serious health and social issues related to youth's eating habits in today's times. So if you have a young child or teen, we encourage you to take part in this annual event. Please remember to always be fire safe! Flooding and water emergencies don’t wait for regular business hours and neither do we. SERVPRO of E. Jackson & S.E. Ingham Co. provides emergency cleaning and restoration services 24 hours a day, 7 days a week—including all holidays. Flooding and water damage is very invasive. Water quickly spreads throughout your home and gets absorbed into floors, walls, furniture, and more. SERVPRO of E. Jackson & S.E. Ingham Co. arrives quickly and starts the water extraction process almost immediately. This immediate response helps to minimize the damage and the cleaning and restoration costs. SERVPRO of E. Jackson & S.E. Ingham Co. specializes in the cleanup and restoration of residential and commercial property after a fire, smoke or water damage event. Our staff is highly trained in property damage restoration. From initial and ongoing training at SERVPRO’s corporate training facility to regular IICRC-industry certification, rest assured our staff is equipped with the knowledge to restore your property. SERVPRO of E. Jackson & S.E. Ingham Co. provides 24-hour emergency service and is dedicated to being faster to any-sized disaster. We can respond immediately to your emergency and have the expertise to handle your restoration or cleaning needs.